In 1997, I was appointed a director of commercial property management at Colliers International in Sydney. There were no female role models in commercial property at the time so it felt like rarefied air with only potential achievements ahead. I enjoyed the role and was earning a good salary, but by 2002 I was at that stage of asking, "Is that all there is?" My twin sister, Helen, and I took a 12 month sabbatical in Noosa to focus on community service and personal development. I embarked on volunteer work; Youth on the Streets, Aged Care Assistance and teaching swimming to older citizens. In 2003 I moved to Brisbane and was Senior Retirement Development Manager at FKP Limited, while mentoring many young women. I was retrenched in September 2012, after nine years, which wasn't what I would have chosen. But I have a good network and now I have a contract as Director of Aged Care and Capital Works Planning at the Queensland Health Renewal Task Force. Along with Helen, I have also been able to retain my passion for community service with a strong commitment to driving the Zonta Birthing Kit Project in Brisbane. One of the most special moments of my life was meeting Dr Catherine Hamlin who runs the Fistula Hospital in Addis Ababa. Probably the most heart rending meeting was with a woman who had developed fistula at age 15. She had finally had the operation she needed, aged 55. She had been living in a bus stop. I find it amazing she kept going with that disease for so long. One final personal achievement was completing the Kokoda Track where I carried my father's dog tags. This was a major physical and emotional challenge of which I am extremely proud. 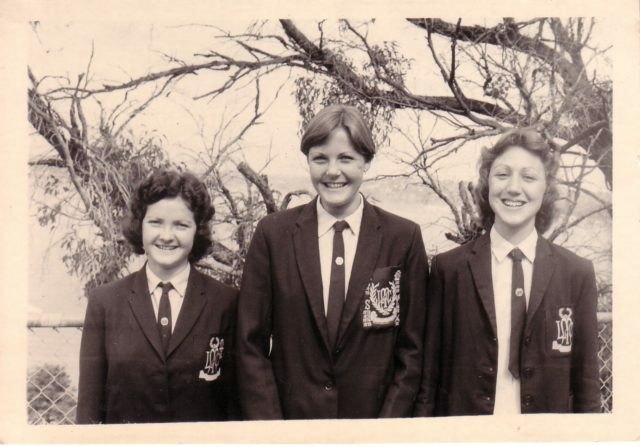 On MLC: I have fond memories of being awarded over 20 colours for sporting achievements over my five years there. The School provided the foundation for my growth and achievements throughout life.